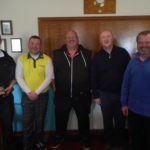 Strong winds were not conducive to low scores in Dunaverty’s March Medal and due to the weather the final result was very close. Grant Edmondson posted a nett 65 to lead from Neil Brodie, Don Hardman, and Raymond Harvey all on 66. 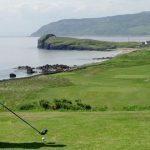 Alex Arkell, playing in the last group mastered the conditions to pip Grant by one stroke and qualify for the Muneroy Cup later in the year. Robert Irvine had the best scratch score with a 76 and the CSS was 63. Result: 1 Alex Arkell 78-14=64, 2 Grant Edmondson 78-13=65, 3 Neil Brodie 79-13=66(bih), 4 Don Hardman 82-16=66(bih), 5 Raymond Harvey 82-16=66, 6 Robert Shaw 83-16=67.